People fascinate me. What they do. What they say. What they wear. People watching is one of my favorite past-times. I particularly enjoy this activity at an airport for two reasons. First, you get to see the widest selection of people in one place AND secondly, it means I’m going somewhere exciting. I find myself distracted by this hobby even at the grocery store. Grocery shopping already takes me too long but add the people watching, and I’m there all night. I’m curious as to why that man wears colored socks with sandals. I wonder why that woman thinks it’s appropriate to wear that skirt… ever. Don’t these people have loved ones at home to prevent them from going out in public like that? I’m not too upset about it though. After all, they provide fodder for my hobby. And now, thanks to the internet and websites like peopleofwalmart.com – people watching is available to all without leaving the comfort of your own home. Watching people drive has me particularly fascinated. I thought about publishing a photo book called “Nose picking drivers.” And if the police would give me a mini-light and siren, I could make about 20 citizen arrests for all the texting and driving I see. What I have never understood is how short a fuse most drivers have. 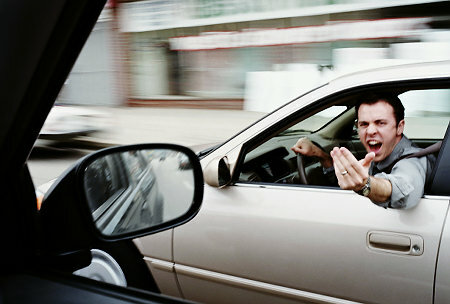 I have noticed that tempers seem to flare quicker behind a wheel than almost anywhere else. Sit at a green light for more than 3 seconds and horns will honk. Don’t turn right on red and even the old ladies start yelling. And for goodness sake, do not go under the speed limit on any highway for any reason. You’ll receive the #1 sign (with the middle finger) almost immediately when they pass. Anger, by definition, is a strong feeling of displeasure and belligerence aroused by a wrong. Apparently, waiting at a red light longer than you have to creates that strong feeling of displeasure. Going too slow is just wrong – particularly if you are in a belligerent hurry. Not all anger is inappropriate, however. There are times when anger is not only normal but expected. Even Jesus expressed righteous rage and in the Temple of all places! Over the years I have used the following checklist to help keep my anger “in check”. Perhaps this will be of benefit to you should you struggle with a short fuse – particularly behind the wheel. Am I angry because I am offended or because God is offended? Have I taken the time to think through this “offense?” What are some likely scenarios that could have caused the other person to wrong me without malice? Would He be angry for the same reasons? Next time you’re tempted to honk – think about this list. Assume the wrong done to you was unintentional. Use the horn for emergencies only and show some Road Grace, even if you’re not on the road.